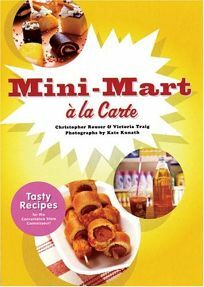 In a book that could make even the most daring foodies cringe, Rouser and Traig (co-author of Judaikitsch) provide more than 50 recipes for readers who wish to craft a meal out of items from the local mini-mart. Employing everything from Cheez Whiz to SPAM, the authors make no attempt at health conscious recipes and even encourage vegetarians to start eating meat. While some recipes seem appetizing, such as Eggs Benedict Arnold and Chicken Wings Cordon Bleu, readers will be more reluctant to try Low Rider Lasagna, which includes cheddar cheese, pinto beans and corn, or Thousand Island Iced Tea, an alcoholic beverage mixed with mayonnaise and ketchup. Kunath has her work cut out for her making these unusual meals look appetizing, and frequently, the challenge is just too great. (What photographer could make Poop on a Pringle-a Vienna sausage, bean dip and Pringle creation-look good?) It's doubtful that ""gourmet types"" longing to ""expand their horizons"" will pick up the book, as the authors suggest. Indeed, it's better suited to the dorm-dwelling college student whose dining options are severely limited.